An interesting (but a bit slow) early Noir novel set in pre-WW2 Europe. Summary plot: Charles Latimer, an English professor turned crime novelist, is vacationing in Turkey, looking for new ideas, when he hears about a thief and murderer, Dimitrios, whose body has just been found floating in the Bosphorus. Fascinated, he decides to travel through pre-WW2 Europe to reconstitute the criminal’s past — only to find that this affair might be too big to handle for a simple writer. 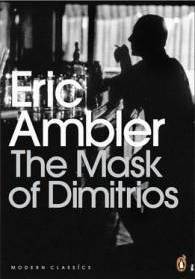 Review: Published in 1939, The Mask of Dimitrios is an interesting brew. It uses most of the codes of the Noir genre — and very early at that — but in pre-war Europe, i.e. an environment both familiar and eerily different to the one we remember from 1940s-1950s Hollywood movies. In that way, it is almost uchronistic. An early Noir novel: from the start, Ambler distances himself from the classical “crime mystery” genre which was still prevailing at the time. In a comic scene, the hero is forced to listen as someone tries to sell him a dismal “the butler did it” synopsis. Ironically, the same character introduces Latimer to Dimitrios’ story, without seeing its potential. It is the quest for realism that draws Latimer to this story — and realism indeed infuses the novel throughout. To start with, Latimer is no super-human Holmes or Poirot: he is a simple writer, who very soon feels out of his depth. Yes, Dimitrios has a certain Moriarty-like dimension, but he started as a simple, lowly Greek date-packer, not a renowned academic. Even when we meet one of his lovers, it’s a disappointment: in spite of expensive clothes and jewelry, Ambler tells us she remains “a slattern”. Meanwhile, Dimitrios’ travel through Southeastern and Central Europe in the 1920s-1930s is clearly interwoven with many actual political crises of the time (and it’s actually very interesting to discover more about Turkey and the Balkans at that time). As for many Noir stories, amorality also adds to the impression of realism. In contrast to traditional crime stories where Justice’s sword is felt hanging over the characters, here the police is depicted as incompetent, uninterested, or even corrupt. Latimer hears about Dimitrios from the head of the Turkish secret police, a possible torturer. Later, when he gets to the bottom of the story, he discovers that nothing of what he knows would entice police action. And in fact, he discovers that he doesn’t really care if Justice is done — he just wants to know. Of all the characters, the only one with a semblance of moral rectitude is a… communist journalist, a hint at Ambler’s anti-fascist positions.